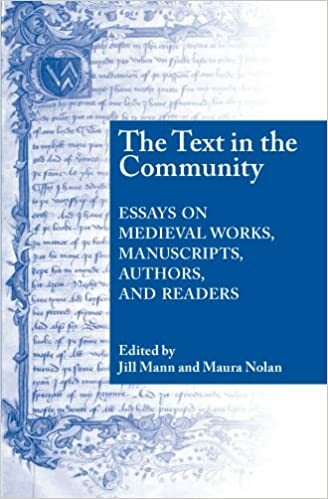 The Text in the Community: Essays on Medieval Works, Manuscripts, Authors, and Readers | Jill Mann, Maura Nolan | ISBN: 9780268034962 | Kostenloser Versand für alle Bücher mit Versand und Verkauf duch Amazon. The Text in the Community: Essays on Medieval Works, Manuscripts, Authors, and Readers. Edited by Jill Mann and Maura Nolan . Notre Dame, IN: University of Notre Dame Press, 2006. Pp. xv+296.